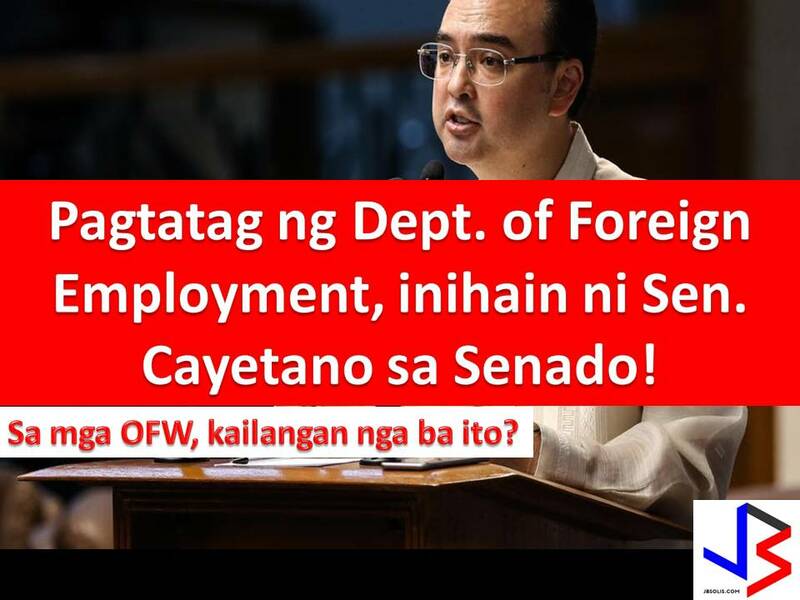 THOUGHTSKOTO Thoughtskoto : Do OFW's Really Need Cayetano's Bill Creating Dept of Foreign Employment? 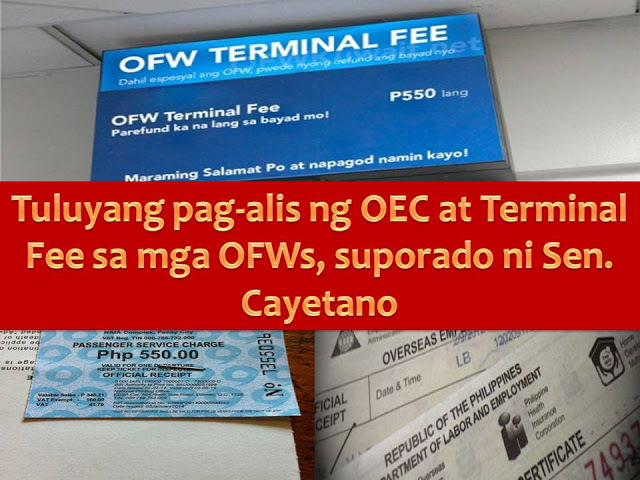 Do OFW's Really Need Cayetano's Bill Creating Dept of Foreign Employment? Maltreatment and abuse are very common to Overseas Filipino Workers (OFWs). This is the reason why Senator Alan Peter S. Cayetano filed a Senate Bill No. 1435 that will mandate the creation of Department of Foreign Employment (DoFE). Cayetano filed the bill after President Rodrigo Duterte announced during his state visit in Saudi Arabia that a department for OFWs is now in the works, but jurisdiction on its creation lies with Congress. 4. The agency will manage, harmonize, and strengthen existing policies and programs to address the needs of overseas Filipino employment. 5. It proposes to create a P1­ Billion OFW Distress and Assistance Fund to provide financial support for OFWs in distress including repatriation and provisions for life-saving funds in times of great emergency - as well as training and livelihood loans for returning OF­Ws. According to Cayetano, around two million Filipinos leave the country each year due to poverty and joblessness at home. Most of these OFWs are forced to endure oppressive work condition at the hands of their abusive employer or illegal recruiter. The head of the agency will hold a rank of Cabinet Secretary and he shall be the primary policy, programming, coordinating, and administrative entity of the executive branch, providing assistance to OFWs in the field of overseas labor and employment. The Department for Overseas Filipino Workers (DOFW) if established aims to promote overall welfare, rights and needs of OFWs, which is a fitting recognition to the "modern heroes" of the country due to their significant contribution to the economy.President Rodrigo Duterte received this two main concerns of OFW when he visited the Middle East last Holy Week. 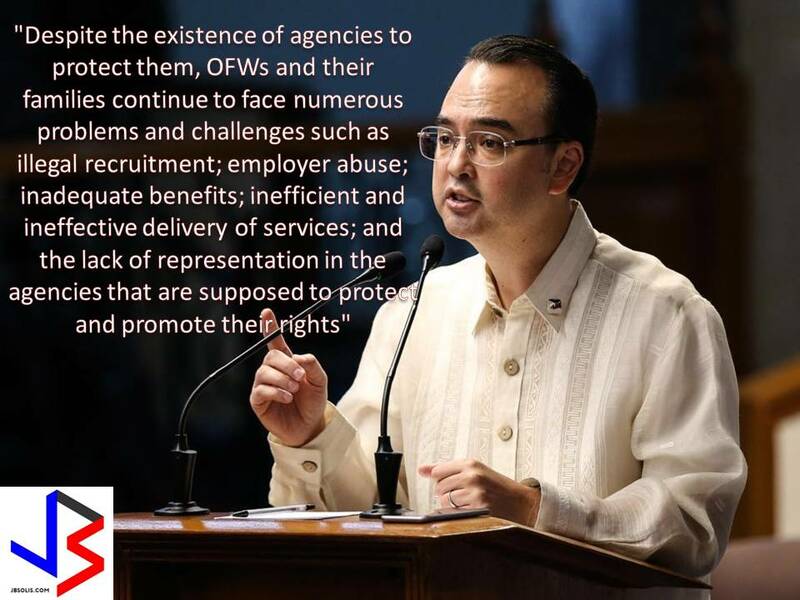 Labor groups who are pushing for the abolition of different fees that burden Overseas Filipino Workers finds favor in the person of Senator Alan Peter Cayetano. The senator expressed his support for the abolition of policies that burden the OFWs. READ MORE: Planning to Work as Housekeeper in Japan? Watch This! Housekeeping in Japan is a dream job of many Filipinos. 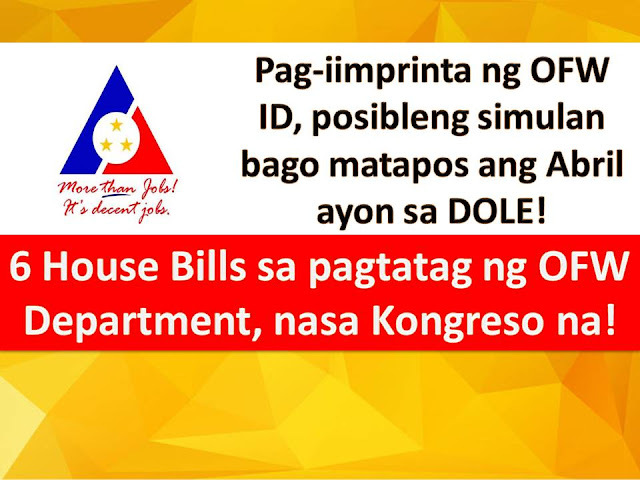 Working with a monthly salary as much as P70,000 is good enough for Overseas Filipino Workers (OFWs) to provide the needs and even the wants of families back home. But aspiring housekeepers in Japan needs a long process of application and training before being qualified for the job.This year, not more than 100 Filipino housekeepers are being deployed in Japan as part of first foreign housekeepers to be hired under a government policy.